June is a terrific month to see some of the showiest orchids in our collection. The Laelia purpurata* varieties, Stanhopea species and Anguloa (Tulip Orchid) species make a wonderful early summer combo. 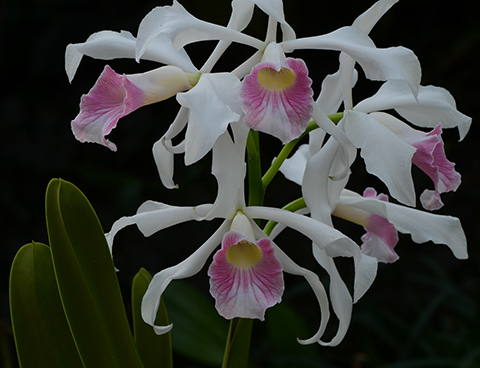 However, it is the Laelia purpurata varieties who are the undisputed stars of early summer. They pretty much own the Orchid Center for from late May until July. Laelia purpurata 'Adam's' x "alba"
Laelia purpurata is enormously popular with orchid growers in warm countries, especially in Brazil, in the states of Rio Grande do Sul, Santa Catarina and Sao Paulo, where it grows in coastal areas. Laelia purpurata is the state flower of Santa Catarina. 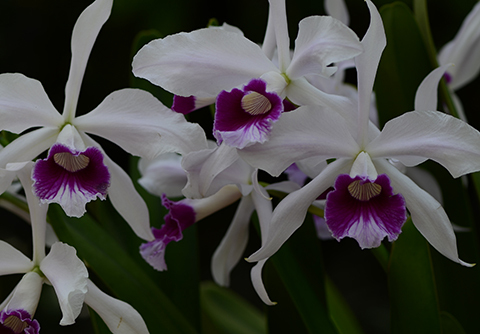 Among Brazil's many annual floral shows the Joinville Flowers Festival in the state of Santa Catarina is the largest featuring Laelia purpurata. 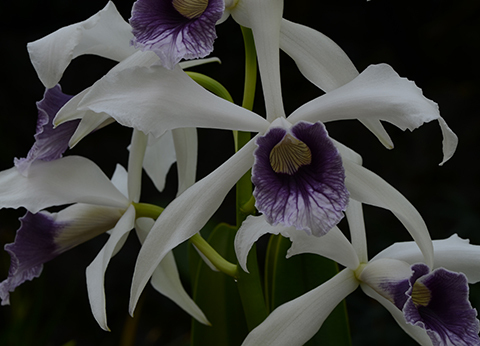 The festival, which hosts varied floral exhibits, scientific lectures, orchid judging, music and dancing, is dominated by the presence of Laelia purpurata and its many varieties. In recent years the festival's visitation has reached nearly 200,000. In Atlanta Laelia purpurata is easy to grow in a warm (65º night minimum) bright greenhouse.They love Atlanta's long warm summers.We grow our plants in clay pots in a standard Cattleya mix of medium grade fir bark, charcoal and sponge rock. They grow quickly and make handsome specimen plants. Stop by and see them!